Powers/Abilities: Robotic body able to survive underwater, possesses superhuman strength. Equipped with a jetpack allowing him to fly. History: In his private laboratory on the coast of California, elderly humanitarian scientist Dr Noah Talbot was testing his latest invention, a synthetic universal blood called hydroglcyerine. Made from “sea water and dense haemoglobin”, hydroglycerine could be used for blood transfusions and was a vital component in Dr Talbot’s second invention, a bald headed, blank eyed prototype android, dressed in a generic red and blue jumpsuit. It was his intention to give his inventions to the US army, so that badly injured soldiers could have their brains transplanted into strong android bodies by Talbot’s daughter and physician, the beautiful, raven haired Dr Moira Talbot (her name is spelt MORA throughout the origin story). Father and daughter tested the hydroglycerine by using it to replace the blood supply of a laboratory chimpanzee called Bubbles. After 15 minutes, he was fine. After 30 minutes, he was uncomfortable and after 45 minutes he was deeply distressed. After 1 hour, Bubbles snapped his restraints and attacked Noah, who frantically knocked him aside into a tank of sea water. Father and daughter were astonished to see that Bubbles was now calm and happily breathing underwater. The hydroglycerine had one flaw: it extracted oxygen from water, not air. It was all too much for Noah Talbot, who promptly had a heart attack. His dying wish was that Mora transplant his brain into the android. No sooner had this been successfully accomplished, than the laboratory was invaded by a Nazi U-boat crew. The Germans knew that Talbot was working on a new invention and had come to steal it. Mora told them that they were too late; her father was dead. Unfortunately, the Nazis saw Bubbles breathing underwater and realised that he was part of the experiment. They took Mora and Bubbles back to their submarine, intending to interrogate her and dissect him. Noah Talbot came back to life in time to realise what was happening, and donning his third invention, a handy jet pack (the android was being developed for the military) he flew to the rescue in his new, super-strong body. While searching, he soon realised that as the android had hydroglycerine in it’s veins, he had to submerge himself in water within one hour in order to breathe. After he freed Mora and Bubbles and the authorities took the Nazis into custody, Talbot realised that the hydroglycerine and the android bodies were impractical for military use, but that he could be of use as a one man “Human Sub”. Donning a steel, torpedo like helmet at the end of his first adventure, Talbot did just that, fighting the Axis during WW II. After the war, new enemies emerged, including The Ancient Mariner (leader of the water-breathing survivors of sunken Atlantis) and flaming anti-hero Prince Burkovette, aka The Blue Blazes. It was during a fierce battle with the former that The Human Sub was supposedly killed. . . . . But Noah Talbot did not die in his battle with the Ancient Mariner! Badly damaged, he used salvaged Atlantean technology (including a nuclear power source) to literally re-invent himself two years later as The Atomic Sub! 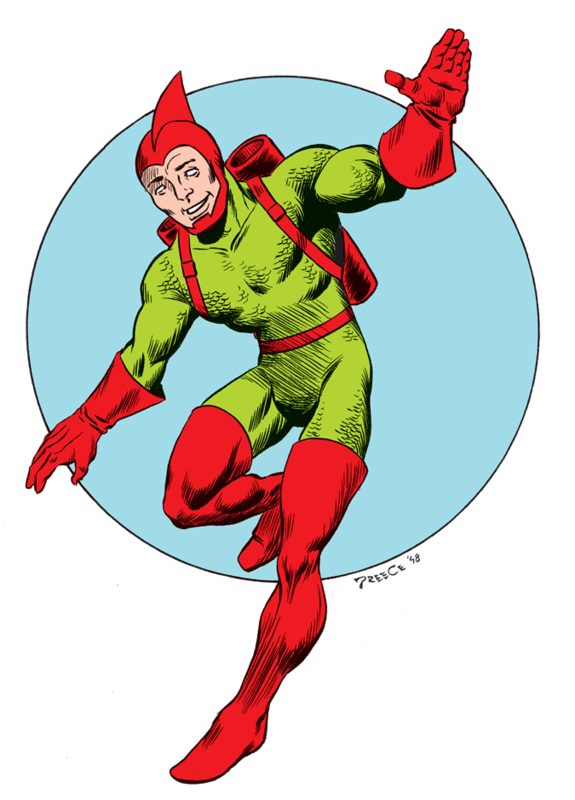 Now clad in an improved red and green costume, with scales and a fin on his cowl (and still sporting a jet-pack), The Atomic Sub became a charter member of the Round Table of America. He also acquired a sidekick in the person of his granddaughter, Moray, a charter member of the Whiz Kids. Noah Talbot was finally killed during the Criss Cross Crisis when he carried the bomb intended to destroy both Earth A and Earth B to the deepest part of the ocean that he could find. The Knights of Justice on Earth B erect a stature in memory of a hero that world never knew. Years later, another old enemy, The Sub Human, attacks the RTA museum, seeking revenge on the Atomic Sub. Enraged to learn that he was already dead, he took out his fury by killing the Earth A Beacon. Comments: Thanks to Chris Adams for information and images. Chris notes “The Human Sub first appears in BB # 2 (Calibre series) and has evolved into the Atomic Sub by BB # 3 (Calibre series). 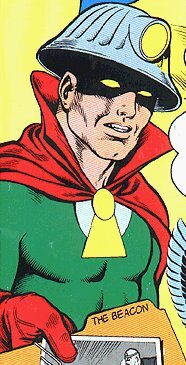 Despite his first appearance being during WW II, he is an Earth A character (he might be the first superhero on Earth A). The Human Sub obviously fills the role of Aquaman and the Sub-Mariner in the Big Bang universe, but with the clever twist that he is not the ruler of Atlantis. His origin also contains elements of Captain America, the original Human Torch, both versions of Robotman and Noman of the T.H.U.N.D.E.R Agents. Powers/Abilities: His jewel can generate a purple force field, a green strength ray and a yellow flight ray. History: While exploring some underground caves, geologist Scott Martin discovered strange, alien crystal formations. Breaking the lamp in his hard hat (and wishing that he had “brought that old lantern”) he followed a source of light and found an underground city, powered by a huge crystal. He was captured as a spy and thrown into a dungeon with Zarkon, the deposed ruler of the city. His enemy Tyrnos deposed him when he gained fantastic powers by wearing a fragment of the Ko-Dan crystal on his crown. Using his geologists tools, Scott was easily able to escape from the dungeon. He defeated Tyrnos in a battle of willpower to control the crystal, which flew into the lamp holder in his hard hat. The grateful Zarkon let him keep the crystal as a reward, and Scott returned to the surface world as The Beacon. Scott did not keep his true identity a secret, and would aid anyone who needed him. He was financed by Texas oil millionaire, Aloysius “Oily” Boyd. After adventuring for some time, he met the Earth A Beacon for the first time. They discovered that their power crystals were identical. Powers/Abilities: Able to run at supersonic speeds. History: During a race in Monte Carlo, racing driver and ladies man Jimmy Travis was forced off the road by his East German rival, Helmut Schletmann. Uninjured, he decided to explore the hidden cave next to where he crashed. The cave contained an abandoned Nazi laboratory, complete with test tubes of secret formulae and a red and yellow uniform marked “Ubermensch”. All of the test tubes were ruined, save the one labelled “Blitz-Geschidigkeit”. Unknown to Jimmy, he had been followed by gamblers who had orders to finish him off. One of them dropped his gun, which went off. The sound of the shot startled Jimmy, who spilled the contents of the test tube on his racing suit. The suit dissolved, but Jimmy was unharmed. With nothing else to wear, he put on the Ubermensch uniform. When the gamblers came in to kill him, Jimmy astonished himself by defeating them with a burst of super speed. He realised that the words on the test tube translated as “Lightning-Speed”, and that exposure to the chemicals had granted him superpowers. Using his new powers, he caught up with Schletmann and dismantled his car. He then raced to his hotel for a spare racing suit, pushed his car to where it would have been if he had not been attacked, and won the race. Afterwards the quick tempered Travis decided to fight crime, taking the name of Schletmann’s car “Der Blitz”. He soon acquired a sidekick (Cyclone) and became a founding member of the Round Table of America. He was killed in an explosion in the late 1980’s. His sidekick, Cyclone was crippled by the blast, but with the aid of cybernetic legs returned to action as Overdrive in the mid ’90’s. Comments: Thanks to Chris Adams for all the information about the Blitz used on this page. He notes that “This version of the Blitz first appeared in Big Bang #3 (Caliber series, reprinted as Big Bang # 6 by Image) in the best BB story ever, “The Cris-Cross Crisis”. 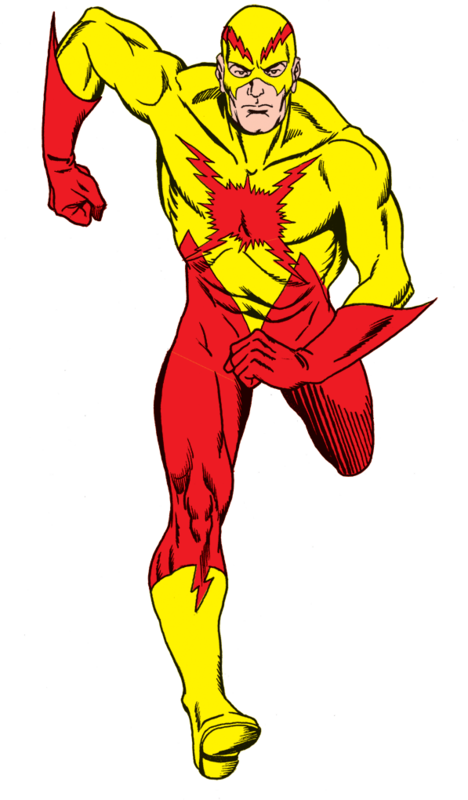 The Blitz differs from the Flash, in that Jimmy’s personality (as well as his colour scheme) are the opposite of the easy going Barry Allen. It would appear that allowing for the 20 year time difference between the two Earths, that Jimmy and Mack (the Blitz of Earth B) got their powers at the same time, in the same laboratory.” The explosion that killed the Earth A Blitz and crippled Cyclone (leading to him becoming Overdrive) was first mentioned in Big Bang # 4 (Caliber series), but it has never actually been depicted. History: While on an assignment in Europe during World War II, newreel reporter Mack Snelling was captured by the Nazi’s, who not only tortured him, but also used him as an experimental test subject. Needless to say, one of the experiments gives him super speed and he makes his escape! Adopting the ugliest costume ever seen on a superhero (a yellow and green outfit with a red crest and goggles) Mack decides to fight the Nazis with the weapon they gave him, mocking them by adopting a German name. The Blitz becomes a founder member of the Knights of Justice. When his fiance needs an emergency blood transfusion from him, she too acquires super speed and becomes a heroine in her own right, the Speed Queen.